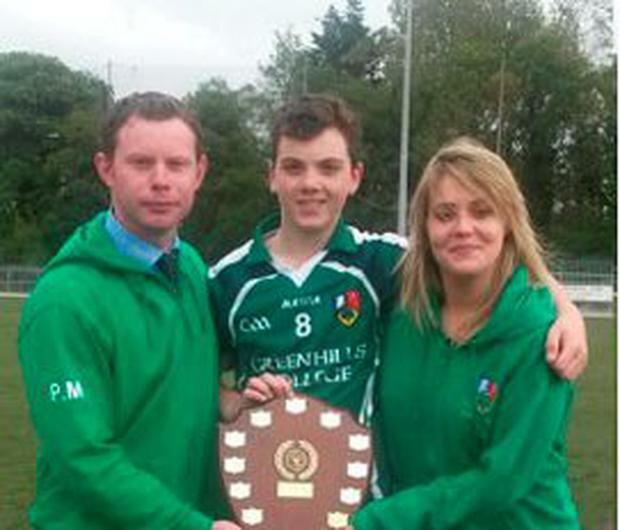 CIAN Nolan helped himself to a brace of goals at St Brigid’s last Thursday afternoon, as Greenhills College secured the Dublin Schools’ Juvenile Hurling ‘E’ crown in comprehensive fashion against Lusk Community College. Greenhills had reached the decider at Russell Park on the back of outstanding victories over Coláiste de hÍde and ColÁiste Phobail Setanta, whereas goals from Luke Codd, Dean Grimes and Thi Fanning ensured that Lusk overcame Firhouse Cc at the semi-final stage (3-6 to 1-2). There seemed to be little to separate the two teams on paper, but it was Greenhills who ultimately dominated the early proceedings. Keith Kavanagh, Nolan, Glen Hales and Craig Raymond were all on target for the Limekiln Avenue outfit, and by the end of the first quarter, they had established a commanding 1-5 to 0-1 cushion. A coolly-converted penalty did offer a lifeline to Lusk, but courtesy of Nolan’s first goal of the contest, Greenhills held on to their ten-point buffer (2-5 to 0-1) for the start of the second period of play. There was a set-back for Greenhills just before interval when one of their players was issued with a red card, but they continued to control the tempo of the game after the restart. Nathan McCarthy’s excellent three-pointer meant that the southsiders were still in control of their own destiny, and even though they had a barren spell in front of the Lusk posts following this goal, they managed to hold firm. A second goal from Nolan effectively placed the outcome beyond any doubt, and after Hales, McCarthy and Sean Walsh all raised white flags in the latter stages of the encounter, Greenhills were able to celebrate their first-ever county hurling final success.